Take it from someone who has done *cough* a lot *cough* of Disney cruises, Disney’s Castaway Club benefits need some reimagining. In my opinion, Disney’s loyalty program for frequent cruisers is one of the weakest in the industry. Other cruise lines just have them beat in this area. I’ve sailed on some other lines, and was recently able to experience the top level of Princess Cruise Line’s loyalty program. Some of the perks blew me away–and made me realize there is so much more Disney could do! Let me first say that I would like Disney to change up their Castaway Club levels. 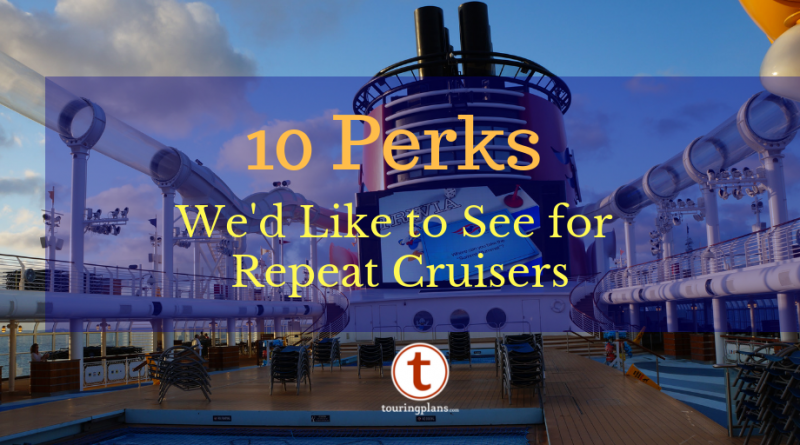 Ten cruises (especially when technically they could all be three-night cruises) just isn’t that many for the highest level of rewards. I’m quite sure one of the reasons Disney hasn’t added more perks is because there are so many Platinum level cruisers now! If there weren’t quite as many at the top level, there would be more rewards they could easily offer. I think they should follow the example of other cruise lines and add another level or two above Platinum. This may be too late to change (that ship has sailed? ), but I would also like to see it go to a system that’s based on the number of nights sailed, rather than the number of cruises completed. I do believe that a 14-night cruise should count more than a 3-night cruise. Early booking of new itineraries. Early access to activity planning online. No assigned port arrival time. Arrive at your leisure and, after checking in, embark as soon as general boarding begins. Priority check-in at the port in the concierge check-in area. 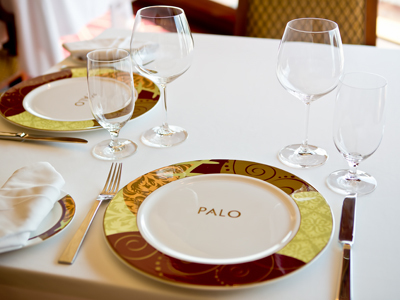 Free dinner or brunch at Palo for Platinum member and adults in their stateroom. A gift from room service – usually fruit, sparkling wine, or chocolate. So here are some perks for the not-yet-real-but-sorely-needed top level (let’s call it Platinum Plus) that I would love to see! And it goes without saying that I’d like to see these added without taking away from the benefits Platinum members have today. 1. Wi-Fi – I realize that some people like to unplug completely on a cruise, and that’s both awesome and preferred for some! But for those of us who need to check in occasionally, or who enjoy staying connected, a free internet package of some kind would be amazing. Most other cruise lines give Wi-Fi to their frequent cruisers. Concierge on Disney gets 100 free megabytes, which combined with the 50 free megabytes from embarkation day, is more than enough to get me through a long cruise. Why not give this perk to all Platinum Plus cruisers? 2. 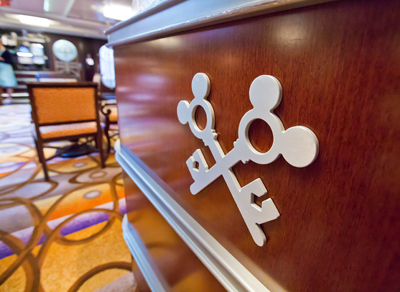 Lounge – This may work best on a new ship, but wouldn’t it be nice if there was a lounge for Platinum Plus guests? Royal Caribbean has just such a lounge on some of their ships, and on some other RC ships they share space with concierge guests. As another option, Princess Cruise Lines designates an area in one of their current lounges on some ships. At times the space was used for nightly receptions, a quiet place to relax (or dare I say – lounge? ), a meeting place with a loyalty/concierge type host, or as a disembarkation lounge for members to use on the last morning until they could disembark. If the top loyalty level is smaller, it’s doable! 3. Mini Bar – On Princess, their highest-level guests have a stocked, complimentary mini-bar. Refills will start to cost money, but it sure is nice to have it stocked the first time! It’s somewhat customizable as well. As a non-drinker, I just picked up the phone and asked room service to replace the alcohol with soda, and voila! I was set for the week. I loved it! 4. Laundry – Probably my favorite perk offered on other lines is free laundry. On Princess, it was unlimited. On Norwegian, it’s one free bag. Whatever it is, I love it. Being able to send out my laundry or pressing, and not wait for an empty washing machine or pay a dime for it? Heavenly. 5. Express Tendering and Debarkation– Two perks on other lines that would be amazing, and not cost Disney anything by the way, are express tendering and debarkation. On Princess, when the highest-level guests were ready to tender, they just went to the meeting place, showed their card, and they were on the next tender. After some decent waits on Disney, and a one-hour plus wait on Royal Caribbean, this was a great perk! 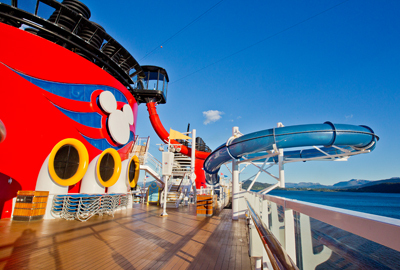 A quicker debarkation on the last morning would be amazing too. Concierge already has it on Disney. It wouldn’t be too hard to add for frequent cruisers. 6. Remy Meal – I’m a huge Palo fan, and I love the free Palo meal benefit. Why not expand it to Remy? Remy is rarely full for an entire cruise, so there should be room to bring in some more guests. If the price tag of a free meal is too much for Disney to swallow (pun intended! ), even a discount for Platinum Plus guests would be appreciated. Half off? I would appreciate it! 7. Onboard Discounts – How about some onboard discounts? A discount on spa treatments or photos. One free photo. How much would that cost Disney? A free float and bike rental, or free snorkeling gear, on Castaway Cay. I think Disney could come up with some more discounts that wouldn’t hit their bottom line and would go a long way to making frequent cruisers feel appreciated. 8. Commemorative Artwork – What if Disney gave out a nice piece of artwork when repeat cruisers hit milestones, like 20 cruises, 25, etc? They already send out small prints to everyone that sailed after they return, so they could take it one step further for frequent cruisers! They could mail it to your house after you sail, or put it in your stateroom one night on board. I would love that! 9. Cruise Discounts – How about actual cruise discounts? Maybe a 10% discount whether you’re on board rebooking or sitting in your living room rebooking. I’d wish for a bigger discount, but that seems a little too lofty of a goal. How about an extra onboard credit? On Royal Caribbean and Norwegian, you can actually earn a free cruise if you keep sailing with them! That would be my favorite perk, of course. 10. Bring Back Perks – My last wish would be to bring back some of the great perks of old. The backstage tours, the receptions for Gold and Platinum Castaway Club members with the officers and other guests on all cruises, not just cruises that are 8 nights and longer. Is it too much to ask to bring back the Rice Krispie treats at the receptions? Surely not! What changes would you like to see in the loyalty program? Are there any benefits you would like to see that I left out? Agree! We’ll make Platinum on our next Disney Cruise, but, to be honest, it doesn’t feel right to be at the same level as people who have cruised 25, 50, 75 times or more! We haven’t been on other cruise lines, but I think it’s also fair to compare to airline and hotel loyalty programs, both of which have the bar set much higher for their top tier. I agree that it would make sense to add another level or 2 above Platinum. Thanks, Laura! You’re right, airline and hotel loyalty programs would be perfectly valid comparisons! Great post. If we’re being honest, DCL essentially has no loyalty program. Case in point: We’ll be gold on our next cruise in April 2019. For a hot minute, we considered booking a 3 or 4 night cruise in between – in order to have gold status in April 2019. But once we looked at the details, we quickly figured out that hitting gold really didn’t get us *anything* except the status of a gold lanyard. (And no, I do not consider early booking of paid spa treatments a perk.) No laundry, no shorter lines, no Palo discount, no drinks or wine, nothing. Zippo. Nada. And to be clear, I don’t think they’re obligated to give me anything. But without any meaningful perks of any kind, there was not even the smallest incentive for us to take that additional cruise in order to hit gold status. And so, we didn’t. ,I completely agree. I’ll be platinum after my next cruise and while it was nice to get a merchandise discount and will be nice for Palo meal, I don’t feel like it’s a loyalty program. Certainly nothing like airline or hotels or other cruise lines. Lately it seems more like they’re reducing or eliminating some of the pluses for the program (receptions) or general (on board booking changes). I’d love to see higher tiers and/or something associated to your days on board vs. number of sailings. Feels like Disney won’t increase the perks because they know people that cruise that much are already committed and will continue to cruise. Same reason they continue to increase prices – we all continue to pay them. Until demand flags and they are forced to compete more directly against “premium” lines it’s hard to imagine too many more freebies. Could be! I am still paying them! Although some of these wouldn’t cost Disney a dime! I think they’re starting to see some of the loyal bleed away. I’m platinum with Disney, but I’ve had to start cruising with another competitor because of prices – who offers discounts to their higher-level repeat customers. Regularly on FaceBook or Cruise Critic I see others who are making the same change I’ve made. While I don’t think Disney is hurting for business or repeat guests, I do think a lot of Castaway Club members are trying other lines for one reason or another! Disney doesn’t need to incentivize loyalty any more than current levels, as there are hoards of people that willingly over pay for meager returns. Why in the world would they add to the current offerings? It’s a strict business decision and reality that if customers will pay for “less”, why do we need to give them “more”? We gave up on being suckered by Disney several years ago. It is, however, pretty amusing to read about the travails of those that continue to pay up! Disney is not a one size fits all, but I still love it. 🙂 I’m glad you found a cruise line that works for you! I struggle with the way that Disney does loyalty. We are a family of six, and have been on three cruises in two staterooms totaling 24 nights for each stateroom. I have paid for a total of 48 nights. After spending significant amounts of money on those three cruises, I have the same status and benefits as someone that has taken a single three night cruise. I would love to see some kind of laundry benefit. On the recent 10 night Norwegian Fjords cruise, finding an open washer or dryer was like participating in a cutthroat Game of Thrones. With that being said, one of the things that I like about Disney is that the cruise experience is very egalitarian. The lack of all significant perks for repeat cruisers means that a new cruiser and one that has cruised many times have a similar experience once onboard, other than pre-booking a few activities. Game of Thrones, lol. I’ve been there! Our Retiree Group just booked a 7 day Eastern Carribean Merritime Cruise on the Fantasy. This will be my 10th! Due to living in a small town we are limited to flight days! 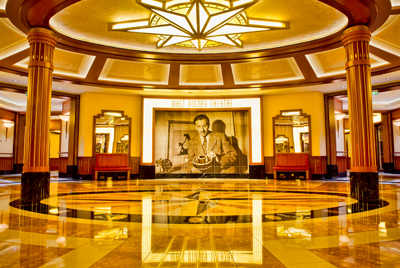 We fly early and add Walt Disney to our cruise. I would like to see a free park day! Disney makes Billions a free gift on my pillow ever night would be Fantastic. We always enjoy Castaway Cay add free excursion of your choice. I have done 3 cheap cruises,Wales Tour, and a Jazz Cruize by the time you add drink pkgs, restaurants, shows you add up!!! That’s so fun! A park day! Ooh, that’s intriguing!